Cox spent much of last season not seeing the playing field. Between Fitz Toussaint, Vincent Smith, Michael Shaw and Stephen Hopkins, Cox was relegated to just a few kickoff returns. 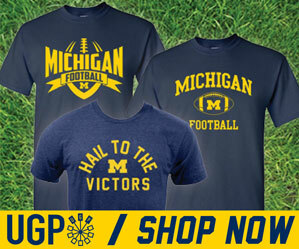 He exits Ann Arbor with only one year of eligibility left. Greener pastures for Cox exist elsewhere. And apparently, elsewhere is UMass. Oddly, UMass is on Michigan's schedule as their 3rd game on September 15th. It would seem that Michael Cox is looking for playing time wherever he can get it, and there's absolutely nothing wrong with that. You have to respect a guy who did his best to get on the field as much as he could here at Michigan, but for many reasons it just wasn't to be, so he's going to where he can compete. This is yet just another case of a guy who has good ability, but just seemed to get lost in the shuffle between coaching staffs and offensive schemes. 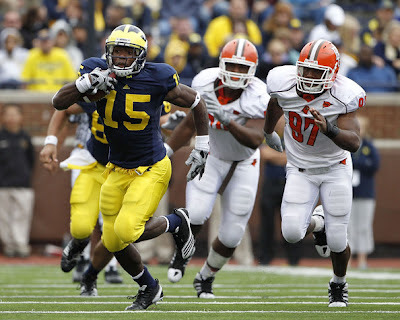 Cox finishes his Michigan career with 19 carries for 169 yards and a pair of touchdowns. 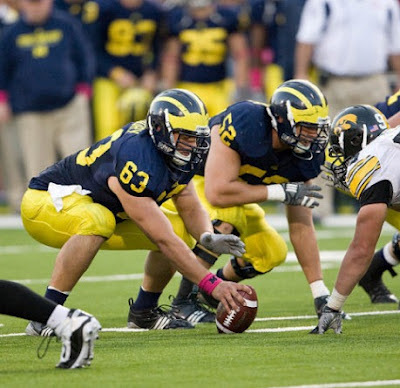 The 2012 and 2013 classes are rife with offensive line talent. But you can't teach experience, and that's what Khoury had...albeit in a typical backup fashion. Rocko was certainly going to be in the mix for at least one of the two open spots on the OL going into spring ball. His departure leaves us very thin at the center position. As of right now, we have no idea why Rocko left the team. Rumors are that the coaches were not surprised by this decision. I don't know if he just didn't have it in him anymore to want to compete, or if he plans on going somewhere else where he can be assured of more playing time? Either way, this leaves the OL with one less experienced backup, but opens the door for one of the incoming freshman to be able step up into a substantial role with this offense.